And it does. 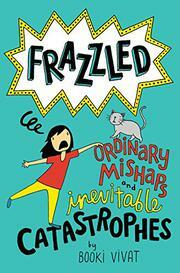 The hilariously glum Asian protagonist of Frazzled: Everyday Disasters and Impending Doom (2016) is back with more mishaps and doom. Over Abbie’s protests, her little sister, Clara, is given a cat for her birthday, and of course, Mr. Felix McSnuggles the Third diabolically terrorizes Abbie when no one else is looking. At school, the sixth-graders are finally getting their own lockers—but when Abbie goes to unlock hers, she finds that it has been “hijacked by a MONSTER.” Things continue downhill when the science teacher assigns everyone to a partner for the upcoming unit, and inevitably Abbie’s partner is...the locker thief. While readers may anticipate the general plot direction (“I guess, when you think about it, some things really do work out”), they will also appreciate Abbie’s astute observations (“Teachers never let you choose your partner, and unless you were very very lucky, you usually got someone you never really wanted to get at all”) and Vivat’s fresh, funny illustrations. Cartoon vignettes seamlessly capture a diverse cast—in a telling aside, Abbie’s portrayal of teachers mistaking her for another Asian girl, Abbie Wong, is particularly sharp.